"The Whole World's a Stage!" Stanislavsky: «Remember this practical piece of advice: Never come into the theatre with mud on your feet. Leave your dust and dirt outside. Check your little worries, squabbles, petty difficulties with your outside clothing -- all the things that ruin your life and draw your attention away from your art -- at the door». Chekhov & BM: one act (On the High Road). According to the (orthodox) Stanislavsky System, we are not supposed to see actor, only the character. Actor must dessolve himself withn his role. If it's true, the words of your character are to follow. You have to establish the basics of you character, situation, genre and etc. and only then you can go for your first line. We have to have it -- the three points. The same holds true in Aristotle's rules for dramatic composition. First is the beginning. Meyerhold in his bio-mechanics broke every act into three parts. There are many famous exercises, we do in class the simple ones -- "Handshake," "Throwing the Stone," sometimes "The Arrow." AIM -- ACTION -- RELEASE. In "Handshake" actor has to establish the aim, that's where the succes of the step two (Action) -- intentions, his character's traits, moods, situations and etc. Next -- The Middle. Action itself is the actuality, it's kinetics of the potentiality, that's what we watch -- the birth of action. We have to have the first part in order for us to experience DRAMA. In "Arrow" exercise the part two is nothing -- the part three follows immediately. Reaction. Did I hit the target, did you miss? The Resolution. The end of the cycle. The reversal of action. In class I do what Meyerhold recommended -- the extra step -- the pause before you go to the next cycle. He called it -- Period. It disciplines the actor, forces him to define each movement within its own structure. Yes, like a drill sergeant, I go with ONE-TWO-THREE.... and FOUR. What about the "natural"? The spontaneity? There is nothing natural about stage, it only looks "natural". Besides, it's a training, we break it down in segments to make sure that every element is in place. When you jump, you don't think where to put your foot. It has to be in your blood. That is what we should call training! Now a few notes about his teacher -- Stanislavsky, the father of the System -- the Psychological Method of Acting. In my and his own words. "Everything in Russian theatre is based on Stanislavsky... But Stanislavsky is a beginning step. After all, he revealed a direction for the theatre of his time, not this time. So he must be advanced... Meyerhold was from Stanislavsky content. Like many others, we believe it is a very good combination." Georgii Tovstonogov. Stage movement and staged movement. Choreographed movement. More complicated than dance -- actor's movement. 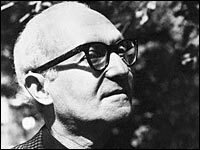 "Naked Stanislavsky" -- Reactions to system brought more system. System of system. X-rays of Method Acting. 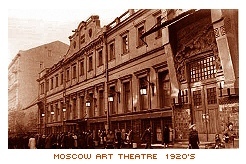 At the First Russian American summer conference in St. Petersburg, Russia was called "School of Russian Theatre," the Third in New York -- "Stanislavky vs. 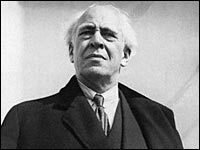 Stanislavsky." .... not just action, but stage action. It must be reinforced that all our definitions (emotions, thoughts, etc.) are within theatre experience, very different in nature next to "real" experience. Opposite? Ways to study and analysis both the character and sense of yourself within the character. Always two parts: Actor's Work on Himself and Actor's Work on His Role. And each is divided on inner and outer work (psycho-technic). Living the Part and Building the Character. "The work on each new role actor must begin with work on himself." Needs to disassemble elements of human nature -- any analysis is always a deconstruction. Active analysis of play and role. "Don't study text (role), study feelings and thoughts of your character." "How to fix emotion, which is only from time to time could be recalled. There's only one way is to do it -- to link an emotion with action. Get used to link an emotion with certain action, on one hand, it's become possible to repeat this feeling through familiar action, and, on another hand, emotions getting linked with different actions, force actor into familiar psycho-physiological states." How did we manage to see the System in two different lights -- pschological realism and method of physical action? "In life, feelings are in search of words; on stage, words are in search of feelings...."
Improv and Text: making it into my words. Text has to be destroyed as a written text. Sometimes I ask them to re-write it with their own handwriting. Memorization process. Class exercises and homework; repetitions. The logic of inner development leads to a necessity of tightening together action with verbalization (verbal action). Emotions must be felt before words. (Pre-acting in his view is the inner acting, a process which leads naturally to a physical expression). Origination of emotion is a first process, the initial point of action. Logic of emotion, logic of developing an emotion, and logic of handling this emotion by the actor. Discovering right feelings (motivation); rehearsals -- logic of character's behavior, logic of his inner state, moods, emotions could and should discover through actor's feelings within the character. "In order to present a simple, a complex, or a mixed feeling, one has to understand the nature of this feeling." Scene = Summary of Components (mind) through logic. Any Dramatic emotion (by Actor) must be a result of all the components, process = becoming, being born step by step. Don't play result ("ready feelings"). After a correct feeling is discovered it has to be recognized and fixed by actor (blocking, props, etc.) Don't play emotions (monolith feeling, blocks). Process in itself guards against fixation of feeling. Action is not through a feeling but a foundation of the feeling. The Trinity: word, thought, feeling. "There are two directions in art of acting: one is imitation of true feelings, another -- re-inaction (stimulation, creation) of true feelings." 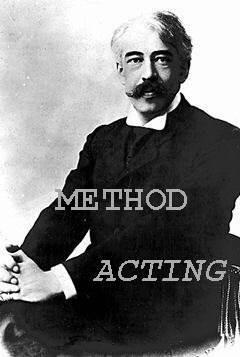 (Actor or Character, see Meyerhold). "Inner design" of the role. Actor must not only know logic of feelings, but also a logic of thought. Connection between a feeling and a rhythm is issue of TIME existence of feeling in SPACE. Result: actor must act, not just feel. Object of communication -- partner (scene), self-communication (partner inside your character, yourself). Homework: Cut everything from the text which could be done without text. "Play on pause"! "Never get caught acting." -- Lillian Gish Action! Inner space and time. Inner monologue. The words not spoken. For every word in monologue I ask for two, three, four not being said. In actor's journals I ask to write the streams of consciousness, the thoughts, related (association) images and feelings, memories. These nightmarish exercises in writing help to open the mental space in actor. In his "Rules for Actors" Goethe writes: "In ordinary life, too, the actor must remember that he is to be part of a public presentation." Artist is always there, artist "acts" all the time. Observation, analysis, imagination -- the artist.